KIRARI completes post-mission utilization phase; signal transmission will be stopped on Sep. 24. Mission operation completed with "extra success"
On Oct. 16 (Japan Standard Time, JST), the mission operation of the "Kirari (OICETS)" was completed after successful experiments with a GEO satellite and optical ground stations. 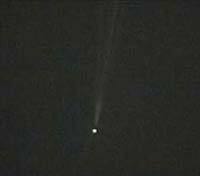 The "Kirari" launched on August 24, 2005, (JST) by a Dnepr rocket from the Baikonur Cosmodrome in Kazakhstan successfully performed bi-directional optical communication experiments with the advanced data relay engineering satellite in Geostationary orbit (GEO), ARTEMIS, of the European Space Agency (ESA) in Dec. 2005. Furthermore, many other experiments were successfully carried out including optical communication experiments with the ground optical stations of the National Institute of Information and Communication Technology (NICT) and the German Space Agency (DLR). The success of the experiment between the lower orbited satellite and a ground station was a global first. 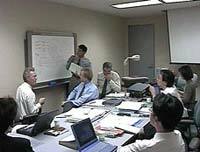 The project team regards those achievements as an "extra success." Through the experience of our mission operation, we were able to demonstrate the possibility of future large volume space communications and to acquire the technology of "highly accurate acquisition, tracking, and pointing," which is essential for optical communications. We will incorporate our achievements into the future development of the optical inter-orbit communications by analyzing the acquired data in detail, while continuously obtaining trend data for evaluating the mission life of the bus (including wheels) and some mission equipment as part of the post-mission use of the satellite. 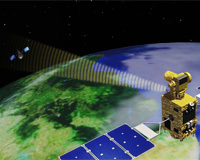 The Kirari, which was launched on Aug. 24, successfully performed a communication test with the advanced data relay engineering satellite, ARTEMIS, of the European Space Agency (ESA) using an S-band (2GHz band) radio frequency. The success of the test moves the Kirari one step closer to the realization of its main purpose as an inter-satellite optical communication experiment in space using lasers with the ARTEMIS. After the launch on August 24, JAXA successfully completed Kirari's critical phase including solar array deployment, initial attitude control, and launch lock release for its Laser Utilizing Communication Equipment (LUCE). The Kirari is now undergoing a thorough operational checkout for each piece of onboard experimental equipment as part of the initial functional verification. We are carefully monitoring the satellite because an extremely strong solar flare at the level of X17 was released on September 7. As the Kirari started inter-satellite communications (S-band) with the Kodama (DRTS) on Sep. 1, satellite operations are now possible even when the Kirari is invisible from the Earth. We will perform an optical communication experiment with the ARTEMIS in November. The Optical Inter-orbit Communications Engineering Test Satellite (OICETS) and the Innovative Technology Demonstration Experiment Satellite (INDEX) were launched at 6:10 a.m. on August 24, 2005, (Japan Standard Time, JST) by a Dnepr Launch Vehicle* from the Baikonur Cosmodrome in the Republic of Kazakhstan. The Dnepr Launch Vehicle flew normally, and JAXA confirmed that the OICETS and the INDEX were separated at 6:25:10 a.m. and 6:25:14 a.m. (JST), and were injected into their scheduled orbits based on information from the ISC Kosmotras. The satellites are under preparation for an early morning launch on Aug. 24 (JST). The propellant loading operation for the OICETS was completed on Aug. 8. The satellites pre-delivery review was the final confirmation before the satellites were delivered to the launch vehicle side on Aug. 11. The OICETS and the INDEX were mated with the launch vehicle on Aug. 14. The OICETS, which is at the launch pad, is now undergoing battery trickle charging and a final verification in the launch configuration by remote control. Photo 1:Group photo after the review. The OICETS is on the right before being mated with the launch vehicle. On the left is a fairing for the Dnepr launch vehicle. After completing the satellite health check with an electric performance test, the OICETS has been under battery reconditioning operations for 50 hours. Currently the satellite propulsion system is being verified. We will soon move onto propellant loading operations. 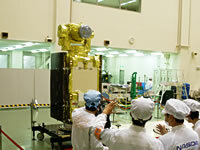 The satellite, which is further protected by the "air cap" in the clean room, is undergoing various tests. Ground Support Equipment and operation staff. The satellite tests are carried out in an area called "SITE 31" at the Baikonur Cosmodrome. Russian, Japanese and Ukraine national flags are flying there. The temperature occasionally exceeds 40 degrees Celsius in summer here. The Optical Inter-orbit Communication Engineering Test Satellite (OICETS) was shown to the press at the Tsukuba Space Center on May 26. The OICETS will be launched by a Dnepr Launch Vehicle this summer. An end-to-end test was held for the OICETS between Apr. 18 and 22 to test communications by establishing a line between two ends to simulate actual operations. At one end was the OICETS, which was in the Spacecraft Integration and Test Building (SITE) at the Tsukuba Space Center (TKSC), and at the other end was the Data Relay Test Satellite (Kodama) in a Geostationary orbit. The test was to verify if we can properly evaluate command and telemetry operations and test data, thus we made the test environment of the "OECETS tracking system/test system" and the "all system interfaces to the OICETS via the DRTS SN system" as similar as possible to the actual operational environment. As the end-to-end test was a culmination of numerous tests we have performed, it was a big event and almost 50 people in total participated. The completion of this test marks the end of operations at the TKSC, and we will start preparations for its transportation. Upper left: During the test, instructions were sent from the Mission Control Center (MCC). The actual operation after its launch will also be done from the MCC. Lower right: The OICETS at the SITE. Under normal operations, a command is sent from the equipment set next to the satellite, but it was sent from the operation room for the test to simulate the actual operational environment. The OICETS, which is scheduled to be launched this coming summer, has been receiving a project checkup and modifications for coping with the change of inclination (from 35 to 98 degrees) due to a change of the launch vehicle. After all modifications were completed, the final satellite verification started in February, and all operations at the manufacturer's plant have been completed. The satellite is now in its flight configuration.From April, the OICETS will be tested using facilities at the Tsukuba Space Center and the DRTS (the data relay satellite "Kodama") for its comprehensive performance. On April 8, an acoustic test was carried out. The Critical Design Review (CDR) was held between Jan. 17 and 28 at SDO Yuzhnoye, (in Dnepropetrovsk, the Ukraine), which is the manufacturer of the Dnepr Launch Vehicle. The purpose of the CDR was to verify if the launch vehicle design and specifications met the satellite requirements for determining their interface conditions. After analysis results of the design concept were carefully examined, the launch vehicle was verified to satisfy the OICETS requirements. Following the completion of the CDR, the launch vehicle will move to the manufacturing phase. 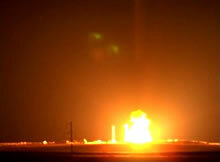 Tests with a satellite structure model and launch site facility verification are also scheduled. Photo (top): Meeting with ISC Kosmotras (launch support provider), SDO Yuzhnoye (launch vehicle manufacturer), NTSpace (satellite manufacturer), and JAXA. Photo (below): Commemorative photo in front of SS-18 (a predecessor of Dnepr Launch Vehicles) displayed at SDO Yuzhnoye. 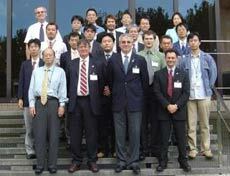 The ARTEMIS-OICETS Meeting was held between Sep. 29 and Oct. 1 at the Tsukuba Space Center. The two parties reviewed the result of the optical communications test between the ground and the satellite held in Tenerife, Canary Island, Spain, in Sep. 2003, then discussed the status of the ARTEMIS (launched on July 12, 2001), the OICETS, and future cooperative relations. The project logo was updated by changing "NASDA" to "JAXA" and adding the names of "NTSpace", who was in charge of satellite manufacturing, and ESA. We received permission for the use of the ESA logo as well as their gratitude. ESA also expressed their hope for an early launch of the OICETS and the optical communications experiment with ARTEMIS in space. The OICETS launch schedule will be informed in a press release when it is available. Optical communications test using laser beams was carried out between an engineering model of the Laser Utilization Communications Equipment (LUCE) of the OICETS and a geostationary satellite "ARTEMIS". The engineering model of the LUCE was brought into the ESA optical ground station in Tenerife, Canary Island, Spain, off the coast of Morocco, to perform the test. The location of the station is favorable to carry out an optical communications test with a satellite in orbit because it is at the height of 2,400 meters in Mount Teide, where the influence of the atmosphere is small. During the test held from September 8 through 16, a station laser beam was used first to capture an ARTEMIS beacon laser beam, then the station beam was turned off to carry out two-way laser beam communications between the LUCE engineering model and ARTEMIS over 38,000 km distance. The communications were successfully made. The LUCE itself also captured and tracked the ARTEMIS successfully during the test without the station laser beam support when atmospheric conditions were good. The LUCE is a small electric device that requires less power to be used in orbit (in a vacuum), and is not designed to cope with attenuation or fluctuation of laser beams due to the atmosphere. Therefore, the ground station's support of capturing the ARTEMIS was required for the test, but the high performance of the LUCE was also proved as it alone captured the ARTEMIS successfully. 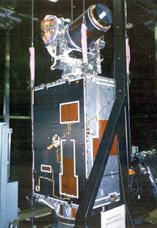 The OICETS is under preparation to be launched into Low Earth Orbit in JFY 2005. In orbit, it is scheduled to perform high-speed large volume communications tests with the ARTEMIS using laser beams to verify its function and performance in space. Photo: Laser beams from the ground station and LUCE capturing the ARTEMIS. A white dot in the lower center is a laser beam from the ARTEMIS. (The photo was taken from the ground.) Multiple lines at the 12 to 1 o'clock direction are laser traces from the ground station, and a very faint line at 7 o'clock is a trace from the LUCE. The Optical Inter-orbit Communications Engineering Test Satellite (OICETS) has completed a proto-flight test as the final check-up for being ready for launch, but is now in storage due to the mishap of ARTEMIS, a satellite of the European Space Agency (ESA), which was launched into unexpected orbit. Those photos were taken during OICETS inspection. The solar array paddles and other attachments were detached for storage in order to prevent them from being damaged. 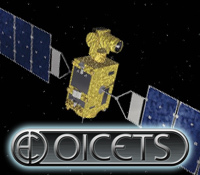 OICETS is scheduled to carry out an optical communication experiment with ARTEMIS, which has been maneuvered into Geostationary orbit in January 2003, one and a half years after its launch. To confirm the compatibility between the Optical Inter-orbit Communications Engineering Test Satellite (OICETS) and the ground operation system, NASDA conducted a series of test simulating real operation. In this test OICETS filight model locating at the Spacecraft Integration and Test Building in Tsukuba Space Center was connected to the tracking and control system via the Data Relay Test Satellite (DRTS) space network, Results of these tests will be reflected on the OICETS operation plan. The DRTS space network is to be established by NASDA Satellite Mission Operations Department, to operate satellites by inter-satellite communication link to DRTS or ARTEMIS. The integrated acquisition/tracking test under micro vibration environment was conducted to evaluate the influence of vibration caused by the on board driving equipment such as solar paddle driving mechanisms against acquisition/tracking capabilities of LUCE. In this test, LUCE engineering model was installed on the OICETS structure model and hung to avoid the effect of external disturbance. LUCE acquisition/tracking capabilities were measured, operating driving equipment in different combination. When we develop such an equipment like LUCE whose performance are specified by µ radian order, measurement equipment becomes an essential factor. The photograph shows the test of LUCE using optical characteristic test equipment newly developed on the level block, which is floated by the air spring in order to prevent influence of external vibration. In addition, this test room is maintained as clean as semiconductor factories to protect optical equipment. Nickel-Metal Hydride (Ni-MH) battery which to be installed in OICETS achieves more compact and lighter (higher energy density) component, while maintaining similar interfaces, compared to Nickel cadmium battery, which is popularly used in current satellites. Office of Research & Development of NASDA has set up battery in the thermostatic chamber and is simulating operational mode and conducting life test etc. 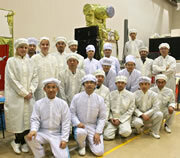 We held the Critical Mission Review (CMR) with ARTEMIS project manager of ESA. In this review, it was confirmed that the requirements for the interface between ARTEMIS and OICETS were met based on the test results of LUCE EM and the data acquired from ESA's ARTEMIS. This animation shows the concept of the movement of the optical part of Laser Utilizing Communications Equipment (LUCE) during acquisition/tracking phase. The optical antenna installed on the two-axis gimbals points towards the direction of ARTEMIS and leads beam to the sensors of the optical system on the back of it. LUCE means light in Italian. 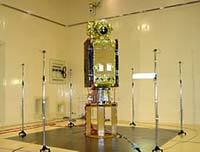 The optical antenna is a reflecting telescope with highly-accurate polished mirror, whose purpose is to send/receive the laser beam. Its structure is all made of glasses so that distortion which is caused by thermal expansion can be reduced to the minimum. Canon Inc., which is responsible for its manufacture, have carefully conducted the inspection because a small scratch could cause a structural destruction. The laser beam of Optical Inter-orbit Communication only diverges approximately several millimeters in one kilometer. In order to communicate through this laser beam, the "beam pointing" must be accurately controlled. 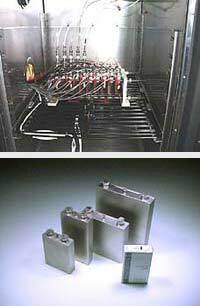 Its performance was tested in vacuum chamber at simulative space thermal vacuum environment.